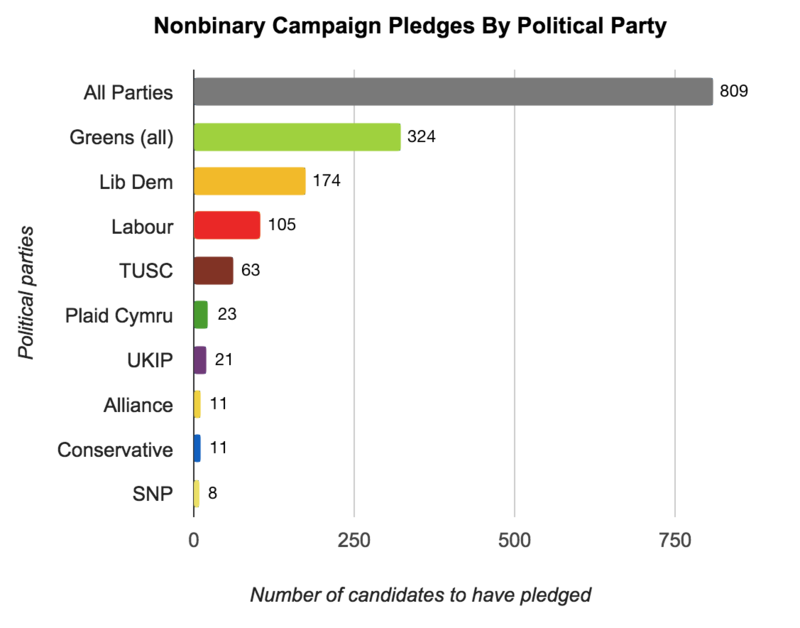 The UK Trans Info Nonbinary Election Campaign allowed candidates to continue to pledge to support the rights and legal recognition of nonbinary people right up to the close of polls at 10pm on election day. The 2015 United Kingdom general election is now over and the results have been declared. The campaign was extremely successful, gaining far more pledges than had been initially expected. 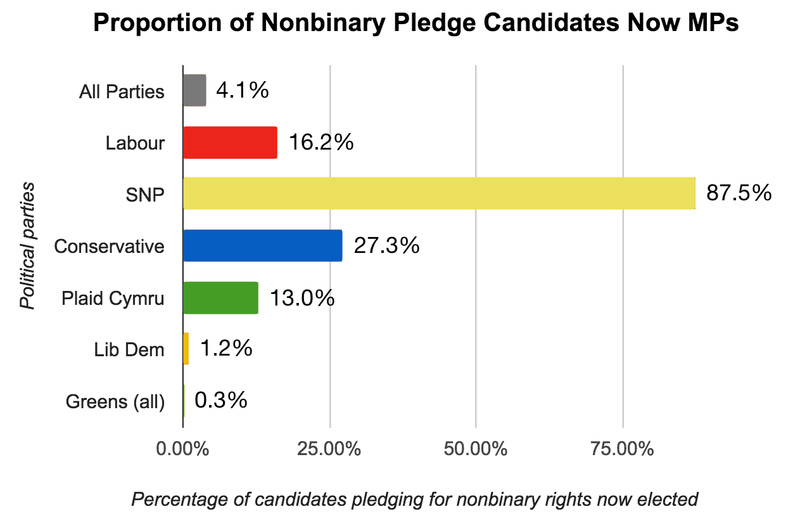 The final numbers saw 809 election candidates pledge support for nonbinary rights and recognition, that’s an impressive 20.4% of all the candidates standing for election. 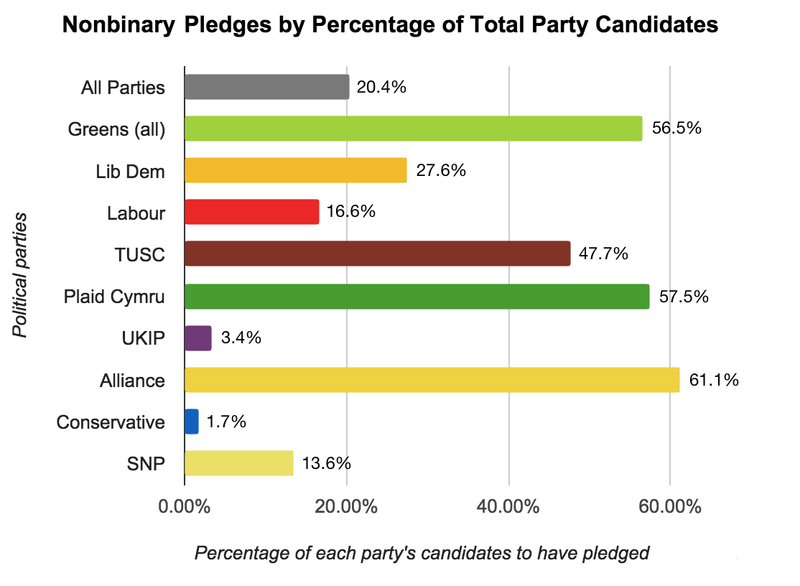 The Green Party made the most pledges with 302 candidates in support, or an amazing 324 once you include the Scottish and Northern Irish Green Parties, that’s more than 56% of their candidates supporting the campaign. Next were the Lib Dems and then Labour with pledge numbers representing 27.6% and 16.6% of their candidates respectively. A number of smaller parties had large proportions of candidates pledging, most notably The Alliance Party of Northern Ireland, Plaid Cymru, TUSC and The Pirate Party. One thing you’ll immediately notice from the above charts is that the party that won the most seats after the election and that went on to form a majority government is also the party with the smallest proportion of candidates supporting the campaign – only 1.7% of the Conservative Party’s candidates, or just 11 out of their 631 candidates, pledged to support nonbinary people. Meanwhile the party (or parties) with the most candidates showing support, the 3 Green Parties, had only 1 on their 324 pledged candidates elected and the party from the charts above with the highest proportion of pledging candidates, The Alliance Party of Northern Ireland, had no candidates at all elected to the Commons. In fact, only 33 of the 809 candidates who pledged support were elected to parliament. That represents only 4.1% of the election candidates who made the nonbinary rights pledge making it into government. Given their landslide victory in Scottish constituencies, the Scottish National Party had the highest proportion of pledging candidates making it into office. Next were the Conservatives and Labour, reflecting their overall performance at the polls. 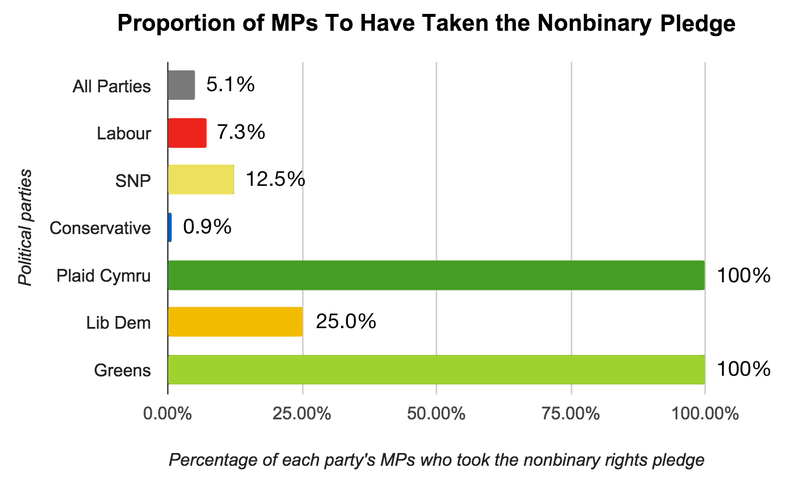 Of the parties that made it into parliament, Labour have the most elected nonbinary campaign supporters at 17 or 7.3% of their elected MPs. The SNP have the next highest at 7 or 12.5% of their elected MPs. Plaid Cymru and The Conservative Party have the next highest number of pledge takers in parliament, a joint 3 supporters each, but for Plaid this represents 100% of their elected MPs rather than the 0.9% of the conservatives. The Liberal Democrats had their parliamentary seats almost wiped out in the election with only 8 MPs remaining, of these 2 or a quarter of them supported the nonbinary election campaign pledge. The Greens kept their 1 MP, Caroline Lucas, and as such they join Plaid Cymru in being the party with all their Westminster MPs supporting nonbinary rights. All other elected political parties including UKIP and the DUP have no MPs supporting the pledge and so have been omitted from the charts. Where Does Nonbinary Support In Parliament Stand Now? This election result has not been a good one for nonbinary rights. Seats were lost by both of the MPs who have previously shown the most support for nonbinary issues in parliament, tabling versions of the Early Day Motion in support for X Passports. Simon Hughes, who was Liberal Democrat Deputy Leader and MP for Bermondsey and Old Southwark, and Julian Huppert, who was Liberal Democrat MP for Cambridge, will now no longer be able to advocate for nonbinary rights and recognition from within the House of Commons. Without these 2 key supporters, it’s important that the 33 MPs who pledged to support nonbinary rights are kept to their word and encouraged to advocate for our rights and recognition while representing their constituents in the House of Commons. You can find the full list of MPs who pledged to support the Nonbinary Election Campaign here, or at the top of the full list of election candidates who pledged support. If your local MP has pledged support then please take the time to get in contact with them and remind them how important these issues are to you, how you’re personally affected as one of their constituents, and what they can do in parliament to make your life easier as a nonbinary person in the UK. 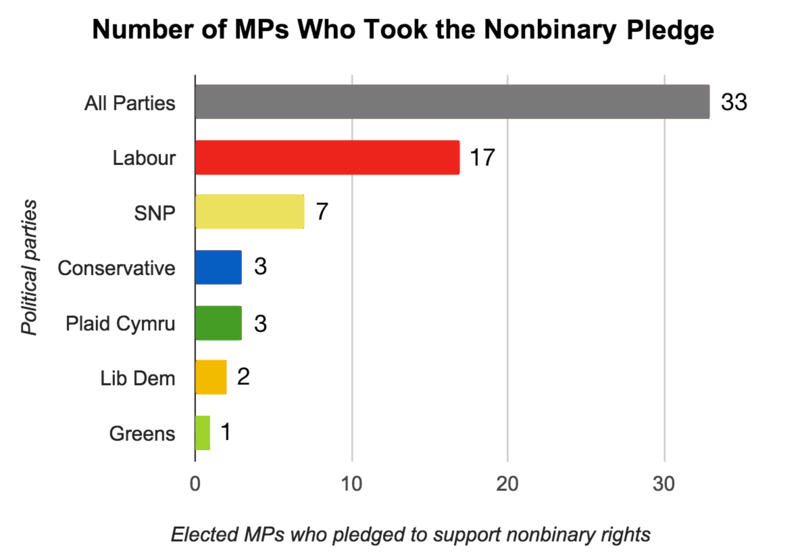 Even if your MP didn’t take the pledge, they may still be open to supporting nonbinary rights. Some politicians are cautious about supporting pledges asking for commitments to particular legislative changes, while still being supportive of the issues involved and open to learning more about them. For example, see this Twitter exchange with my newly re-elected local MP Lilian Greenwood. Politics don’t just stop at elections, once the new cabinet has been selected, and all the other parties select new leaders and positions within the party following the election, I would recommend writing to your MP or better yet going to their surgery to see them in person. Remind them of that nonbinary rights and recognition are important to you, explain how the current legal situation makes your life harder and tell them what they can do to help. You can also help by getting involved with or supporting campaigns for UK nonbinary inclusion and legal recognition, or with organisations focused on improving the lives of trans and nonbinary in the UK. Together we can keep nonbinary people on the political agenda.